Can A Messy #NaNoWriMo Project Be A Success? NaNoWriMo is the National Novel Writing Month. Basically, every November, aspiring and published authors take it upon themselves to complete a FULL-LENGTH BOOK of 50,000+ words in four short weeks. It seems like an impossible task, but IT CAN BE DONE. Even though this is my first year participating, I’m happy to report that many successful authors have conquered NaNoWriMo. Among them is literary legend Kelley Armstrong and bookish comedian C.G. Drews (i.e. @paperfury). At a recent Q&A panel with Kelley Armstrong (NY Times Best Selling Author), Kelley revealed that she uses NaNoWriMo as a way of testing out new projects that she’s uncertain about. Even if the project is totally messy and she tosses the whole thing, she keeps the concept and rewrites it. Participating in NaNoWriMo led to her first YA fiction, The Summoning, being born. Alexandra Bracken (author of The Darkest Minds) is joining the fun with a higher word count of 80,000 words! Go girl! 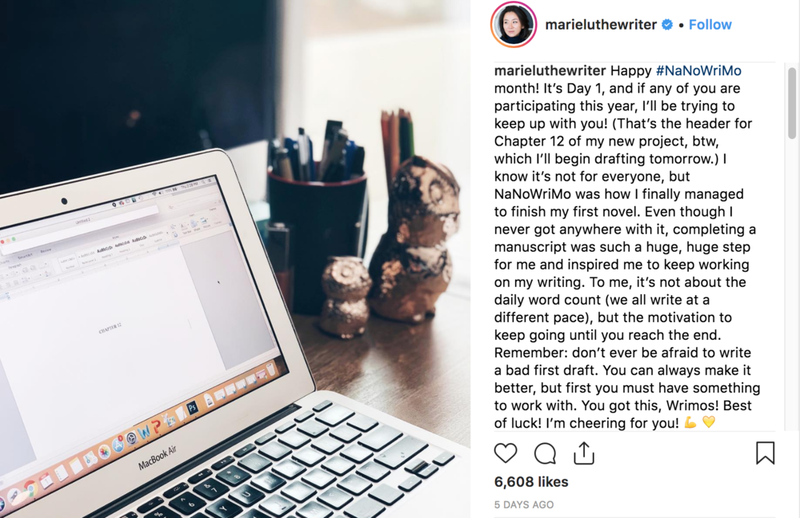 And Marie Lu (author of Legend and Warcross) is using NaNoWriMo to work on drafting her new project. She’s cheering you on! The fact is, you are writing an ENTIRE NOVEL in the span of four weeks. It will not be perfect. It will not be ready for publication. It may even require a rewrite. That doesn’t mean your messy NaNoWriMo project should be thrown out entirely. It simply means that it needs more work to get to a publishing level! There are MANY authors, both aspiring and published, who have seen the benefits of participating in NaNoWriMo! Why not try it for yourself? I am! Sign up to receive quick updates, exclusive content, and info on current WIPs. Did I mention there will be GIFT CARDS?